The BEFORE the trip and first night in Vancouver debacles part. It’s 2 weeks before we leave for Vancouver and we plan to ship our bikes via Amtrak. I did it on my first touring trip from San Diego to Santa Barbara and it worked out so great. I swear by it if you ever need to take a bike on a trip in the US. * Key item of note here “US.” Anyways, I’m in Georgia visiting my parents and Andrew and I are on the phone getting details worked out. I tell him I have this nagging feeling that i should call Amtrak to ensure they ship to Vancouver. “I’m sure it’s fine” Andrew assures me. But I still want to check. A couple of days go by and I forget to call within their operating hours, so when I finally remember it’s getting close to our deaprture date. When I call, I make sure to have all of my questions written out to be sure I dont forget anything. Question #1: I’m flying to Vancouver and I wanted to ship my bike to Vancouver and then bike down to Seattle. What is the address of the Vancouver Amtrak station? Answer: We don’t ship to Vancouver. The closest you could get is to Bellingham. WONDERFUL…it’s 60 miles away from Vancouver. Totally doable, right? I start shooting off ideas on how we will get the bikes from Bellingham without taking up a whole day of exploring Vancouver. We could take a train down and bike back up OR rent a one-way car and bike back up OR we could just rent a big truck and bring them back up. All of these options are either time consuming or wallet consuming. Andrew and I settle on taking an Amtrak train down and potentially biking back up or just putting the bikes on the train and go back up. So we are on the phone buying train tickets. They require passport number and expiration dates, so he gets the passports since I’m still in GA. Lo and behold, my passport had expired 3 weeks earlier! At this point I’m losing my mind. We haven’t even started our trip and I have managed to forget such crucial details that should have been addressed way before we bought our flights. Rest assured! I was able to fork over an expediter fee to the passport agency and I was able to get my passport renewed within 2 days of leaving for Vancouver. Woohoo!!! That was obstacle #1. By the time I got my passport, Amtrak train tickets to Bellingham from Vancouver were no longer available. I decide a Zip truck is the cheapest solution because a truck rental was going to cost of $130 for the day. Therein comes obstacle #2: I left my Zipcar card at home!!! I realize this at the airport. Thankfully, the friendly folks at Zipcar have offices conveniently located in major cities and they informed me I could get a replacement card super easily by going to their Vancouver office to pick one up. SWEET. That’s settled. Now that we get all of those things settled, things just stop surprising me. I could have forgotten anything at this point. Thankfully, I didn’t! Obstacle #3: We have a layover in Chicago that is only supposed to be 50 minutes and it turns into a 3 hours layover! Freakin’ United Airlines. I can honestly say I have never had a flight go as it should with United. 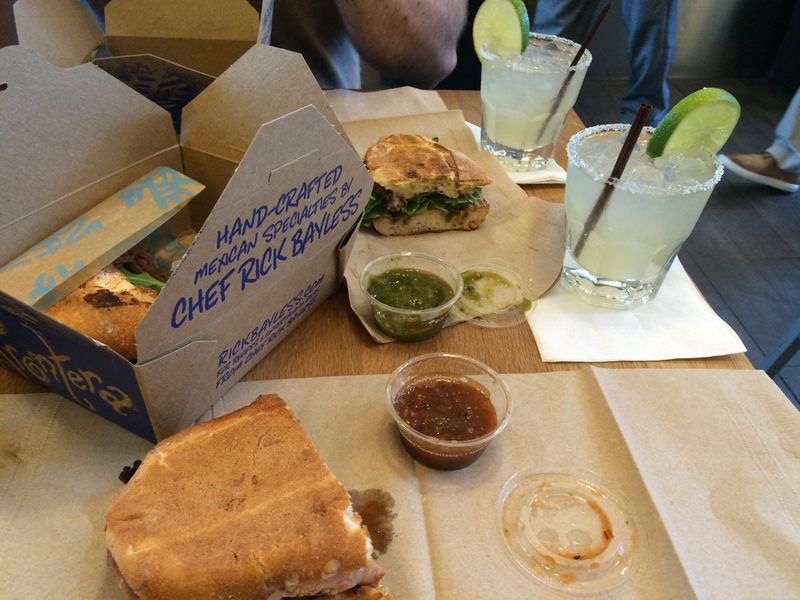 We decided to make the best of it and enjoy some delicious Mexican Tortas and margaritas at Frotera in the O’Hare airport. Yum! Mexican Tortas from Frontera at Chicago O’Hare aiport. The only legit airpot food I’ve ever had. Obstacle #4 My dear Seeesterloo lives in Chicago, so I give her a ring and tell her about our layover situation to se if it’s worth it to try to hang out for a couple of hours together. She decides to pick us up! After about 15 minutes of waiting for her to pick us up we get notified by United that they moved the departure time up. We went from having a 3 hour layover to under 2 hours, which means we only have about 15 minutes to spend with my sister. Darn! We make the best of it! She picks us up and we just do loops around the airport talking and catching up for 15 minutes. ‘Amusing’ is the word I’d use to describe that. Anyways, we finally get on our flight and arrive in Vancouver late evening but early enough to see the mountains! 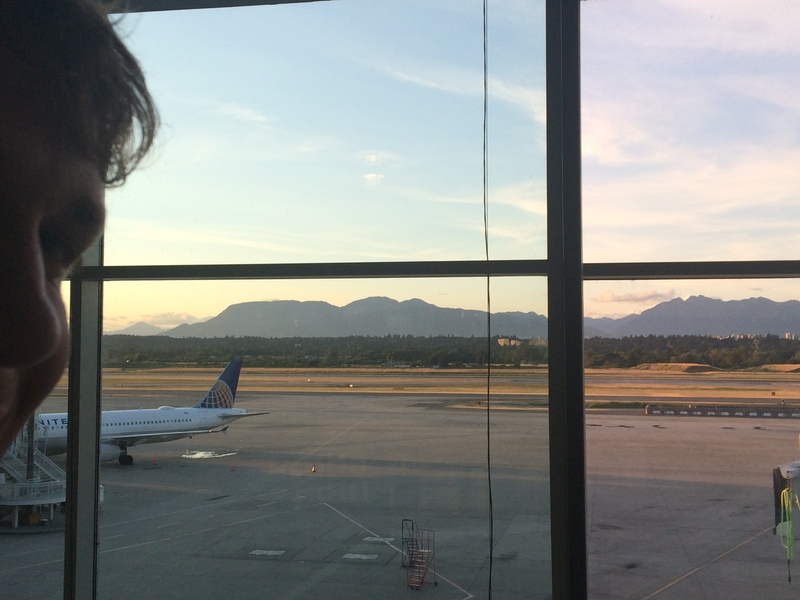 The mountains outside of the Vancouver airport! By the time we get through customs and out of the airport, it’s closer to 10:30 at night. We get to our airbnb and realize it’s not only really cute and straight out of an ikea catalog, BUT ALSO really tiny and we’re sleeping on an ikea sleeper sofa. When you travel on a tight(ish) budget, your airbnb choices in a big city are limited. Somehow I didn’t pay attention to the description when I booked this place. I was distracted by all of the bright whites and clean Swedish designs! Whatever, we are dealing with it, and so ready to feel like we are on vacation and not working as hard as we have been so far with the passport issues, Zipcar card replacement, zip truck pickup, bike pickup in Bellingham dealing with traffic at the border and returning the zip truck in time. It was a busy first day in Vancouver to say the least. You know how Canadians are known for their niceness? 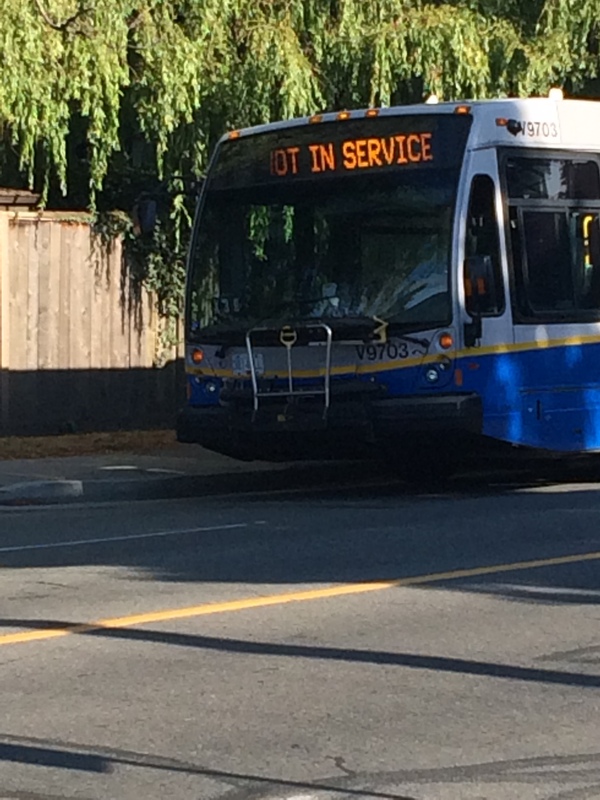 Well, this bus sign totally solidifies that notion. 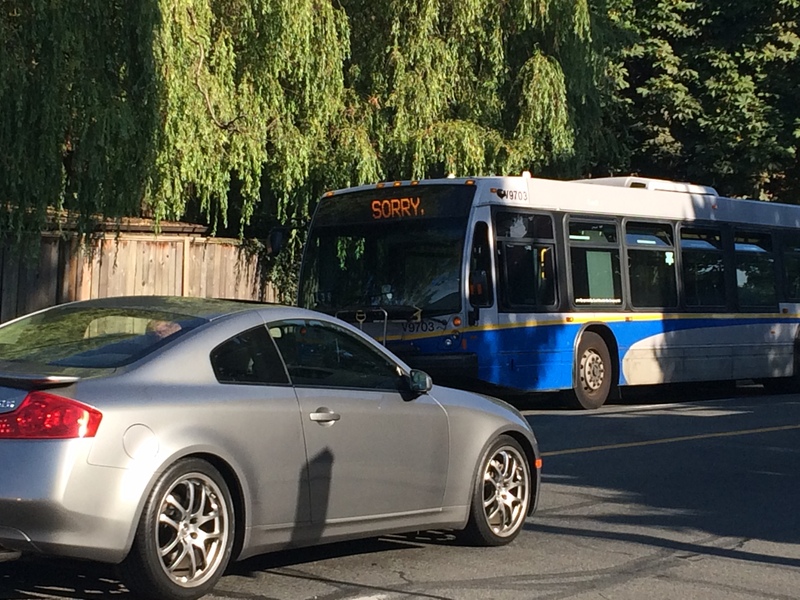 I’ve never seen a bus apologize for not being in service, but I LOVE it. The people are super nice too. We made it back to the Zipcar station with 3 minutes to spare, got the bikes out and the gear and spent the rest of the afternoon from around 3pm-7pm exploring the city and the seawall. It doesn’t take long for us to completely fall in love with this city. Stay tuned for the rest of our Vancouver experiences, many many pictures and the details of our actual touring days. And then……. Don’t keep us in suspense for too long we want to read the second part.